Prior to this read along, I was not familiar with Michael Crichton. I quickly learned that he is an MD, the author of Jurassic Park, and the creator of ER. I am a nurse, so the prospect of a fictional novel based upon medical research immediately appealed to me. Crichton shows the speed with which research is advancing. The goal of this research is not the health of individuals or society, but to increase the wealth of corporations, Universities, and individual researchers. Legislation and the court systems are not able to keep up with the advances, so individual's rights are being compromised. He shares a number of articles throughout the book to give the impression that this is real scientific research that is being conducted. At times, I honestly wondered how much of this is real and how much is fiction. This novel has several story lines involving genetic research that eventually come together in the end. We are first introduced to the owner of a biotechnology company. We experience research from the scientists perspective and quickly see why research on human subjects is strictly regulated. We are then introduced to a man involved in a court case in which his cells were obtained illegally for research purposes. Does an individual have the right to receive a portion of the profits generated by researchers that used his cells? This is just one of the questions brought before the courts. We are introduced to a few transgenic animals who act considerably more human than animal. A talking bird named Gerard, a half boy/half chimpanzee named David that is living in a traditional home, an orangutan living in the jungle that can speak multiple languages, turtles that can change the color of their shells to display a message. How will experiments such as these impact research and evolution as a whole? Crichton addresses these issues and others with the scientific focus of a researcher and physician. I found this book to be very fascinating and an enjoyable read. For someone that is not in the medical field, I can see where it may not have the same appeal. He uses medical terminology that I would never use with individuals that do not have a medical background. He may lose some readers with the level of detail. 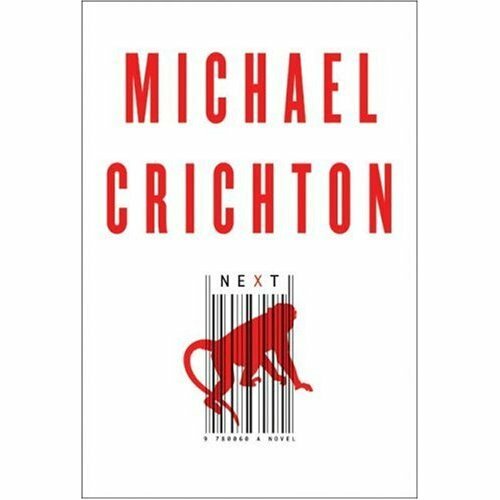 I am a huge fan of Michael Crichton because of ER. I was the biggest fan of ER! However, I have only read a few of his books and when I saw this one I thought it would be a great read! I am not big into the medical world, I picked the legal world instead, but I do enjoy a good medical mystery when I find it. The one thing about this book that was a dislike for me was: so many story lines. It took me a re-read of some of the chapters to keep up with the characters. With that aside, I loved how I was able to understand what was going on in the book even without any medical knowledge. Although, there were some situations that I had to Google because I did not understand the procedures. I also loved to see the "future" of the medical field, especially when it comes to genes/DNA/animals. In my heart I am almost sure that we are not too far away from some of these advancements. By the end of the book all the storylines were cleaned up and it was interesting how Crichton did it. I thought the book was well written and it was a quick read. I was obsessed with Michael Crichton growing up. He was one of my favorite authors. I was fairly young when I went through my phase with his books, and I still remember how Sphere and Congo completely rocked my world. Great books! After that phase of my life ended, I didn't pick up another Michael Crichton book. Until Next. Next is composed of several different story lines that I assume come together at the end. I "assume" because I did not finish the book. I started listening to it on CD, and Jacque commented that it might be kind of hard to follow along with all the different plots when I was listening to it as opposed to reading it. She was right. Because I was listening to it at different times, too -- just whenever I drove somewhere -- it ended up that I was always listening to a different story at a different time. I couldn't remember what had been going with the stories before, and I very quickly got lost. After giving it my best effort, I tossed in the towel. About a week later, I saw that my library was selling a hard copy of the book. As I was considering buying it, I pulled it off the shelf to try reading a bit and see how far I'd gotten. Turns out I'd made it about 1/4 of the way through. But as I skimmed pages, I was not motivated to continue reading it. As I told Jacque, it was "kind of interesting. Perhaps if it was shorter, I would have stuck it out." I enjoy hearing the research studies. I did find them kind of interesting. Just not interesting enough to read another several hundred pages of disjointed plot lines.